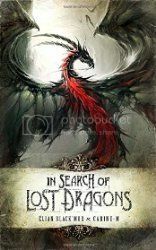 In Search of Lost Dragons is a travel journal kept by a reporter as he travels the world in search of dragons. The journal entries are very disjointed, to the point where I thought I was missing pages in my volume, but in the end, there is something of a cohesive story being told throughout as the journalist continues his search for dragons, discovering long lost nomadic tribes and long hidden cities in the process; still, I'd have to say that the "story telling" is rambling to say the best. The art in the book, however, is gorgeous. Presented as photographs and sketches of the various species of dragons discovered on the journey, the art in this book is stunning. Just take a look at the book trailer above to see what I'm talking about. I didn't know a thing about this book, and ordered based on what I saw in that trailer, and I'm so glad that I did. The dragons are simply gorgeous. So, what the story lacks in cohesiveness, the art absolutely makes up for it detail. This would be a great addition to a fantasy library!